A 35-member delegation of American Hibernians led by AOH National President Jim McKay showed their solidarity and support to members from the Ballymurphy Massacre Families as they accompanied then to Laganside Court on Monday. The group attended the morning inquest session as part of a nine-day fact-finding visit. 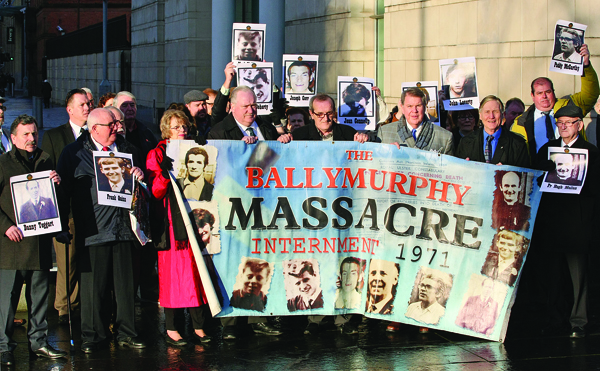 Ballymurphy Massacre spokesperson John Teggart told Daily Belfast that he and other family members will take the delegation on a tour of the Springfield Road today (Tuesday) to show them the exact areas were their loved ones were shot and killed. “The AOH gave us great strength going into court on Monday,” explained John. “Support such as this gives the families great heart and it is really encouraging to see that level of support for our campaign coming from America. “We will be giving the group a tour of the Springfield Road area to show them where exactly our loved ones fell. They will be standing in the spots where they were murdered. “This is a very significant week as the inquest will hear from Bobby Clarke who was shot and wounded. Father Hugh Mullan and Frankie Quinn were going to his aid when they were shot and killed.